One big use for the 10-K is context: If you want to put a number in context, you can compare it to the previous year’s net income or assets, as appropriate. Or to show a company’s reach, look up how many countries or states it operated in the previous year. The latest 10-K may hold more current information, but the 10-K tends to be more comprehensive. Companies must provide an annual employee headcount in the 10-K, for example, but many don’t update it each quarter. If you just need a yardstick to give your audience a sense of scale, the 10-K is often the quickest resource. The exhibits that accompany a 10-K can include a wealth of detailed information about a company’s operations, internal policies, and more. 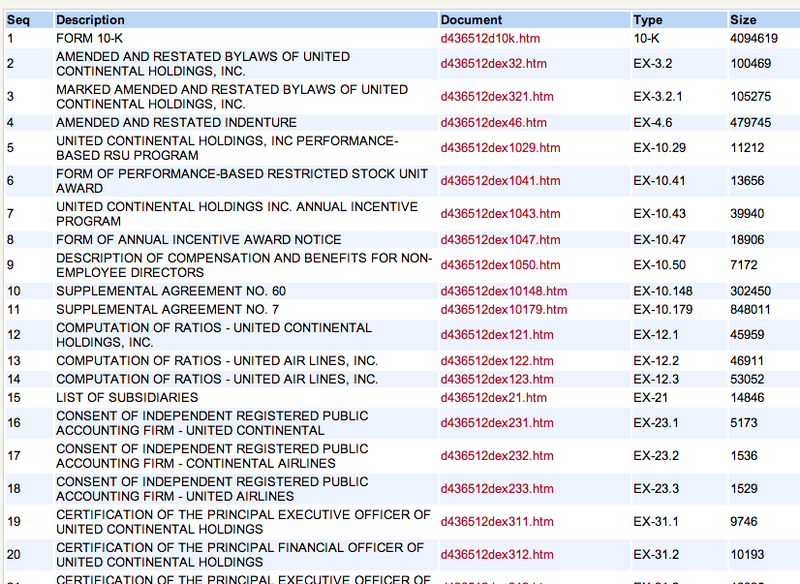 A few are in nearly every 10-K, including Exhibit 21, which lists a company’s major subsidiaries. Others are simply routine, like the certifications signed by a company’s chief executive and chief financial officer. In Edgar, you can access exhibits from the index page that appears when you first pull up a specific filing (the same place you click to open the body of the 10-K itself). Exhibit Exhibit: The first link is UAL’s 10-K; the rest are some of the more than two dozen accompanying exhibits. Exhibits are coded according to broad content areas. So exhibits numbered with a 10 – e.g., 10.3 – are material contracts, including executive pay agreements. (Sadly, when it comes to the really important operational contracts, like licensing agreements or asset purchases, key details are often redacted.) Exhibit 21 is a list of subsidiaries; exhibits numbered with a 14 are ethics codes or related policies. Exhibit 99s are often press releases. You can find a full list here (PDF). Many exhibits are routine, and potentially sensitive information is often redacted, especially from contracts, but it’s worth taking a look at what exhibits accompany a 10-K or 10-Q. If a particular exhibit is befuddling, check the body of the 10-K – often it’s mentioned in there somewhere. 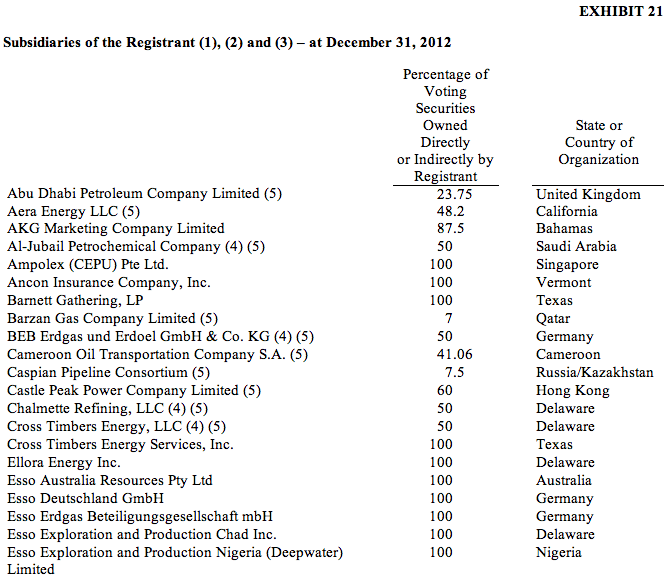 Exxon Mobil lists subsidiaries in California, Kazakhstan, Cameroon and Qatar, among other places, in its Exhibit 21. A few exhibits, numbered 101, will look like gibberish if you pull them up the usual way. These are the company’s financial statements in XBRL form – see below. You can do something similar yourself, with a little effort. Copy and paste the body of a filing or an exhibit into a Microsoft Word document. Then do the same with the previous version, and use Word’s Compare Documents feature to see what’s changed. (Some other word-processing applications have similar features.) Alternatively, online services like textdiff.com are good for smaller chunks of text, up to several paragraphs. Also, as you skim a 10-K, keep an eye out for recent dates, since most companies will attach dates to significant developments. Just watch out: Companies sometimes omit dates, so this isn’t a foolproof approach. Identifying new information in the lengthy Risk Factors section can be especially hard. The prior 10-K will have a comprehensive list, of course, but sometimes the company has updated some or all of the risks it faces in one of the intervening 10-Qs. That means you should at least glance at the last three quarterly filings before simply comparing this year’s risks with last year’s. It’s a pain, but it may save you from having to backpedal after reporting out a not-so-new disclosure. For the most part, 10-Ks and other SEC filings are just long text documents, with a little bit of HTML formatting to create tables and make the documents more readable. But that’s changing – slowly. Most companies now file certain kinds of information in a “structured” format called XBRL, for “eXtensible Business Reporting Language.” (For the technically inclined, this is a flavor of XML.) Much more information about XBRL is available elsewhere (including XBRL.org and the SEC’s XBRL page), but it essentially allows tabular information to be displayed more quickly and consistently. That can be useful if you need to quickly pull up a company’s income statement or balance sheet, or tables showing its geographic markets. For now, though, this data is available only for 10-Ks and 10-Qs. The SEC has its own XBRL “viewer”; you can click a filing’s blue Interactive Data button in the search results list, or in the filing’s index page. Once there, a link just under the company name lets you pull the data into Microsoft Excel or another spreadsheet application. Private filing services are starting to make good use of XBRL data as well, including at SECLive.com. Over time, XBRL should become more useful. Clicking for Numbers: The SEC’s “Interactive Data” view generates tidy and consistent tables from XBRL, such as this income statement for Google. Note that these XBRL versions of the filing are included with the rest of the 10-K, and show up as all-but-unreadable exhibits numbered 101. Download our free guide to covering business on 17 beats.